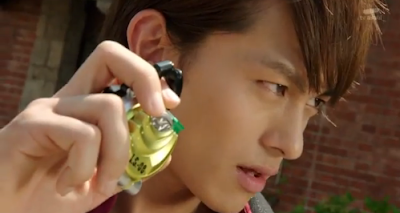 Kamen Rider Gaim episode 5 is entitled: Return! The Ichigo Arms of Friendship "Fukkatsu! Yūjō no Ichigo Āmuzu!" (復活！友情のイチゴアームズ！). Kouta tries to overcome the events that befell him in the Hellheim Forest against Zangetsu while Kaito challenges Mitsuzane to a fight, with the new Armored Rider Ryugen unable to fight Baron on his own.